Make Fathers' Day Delicious - Available here at St Marcus! Home / Blog / Fathers’ Day is Just Around the Corner! Fathers’ Day is Just Around the Corner! Did you know that Fathers’ Day was invented by American Mrs. Sonora Smart Dodd who wanted to honour her father, a veteran who had, as a single parent, raised his six children. The first Father’s Day was celebrated on June 19, 1910?! Read more here. Traditionally fathers should be given the gift of white or red roses. The rose is the official flower for Fathers’ Day. Wearing a red rose signifies a living father, while a white one represents deceased father. And did you also know that, surprisingly, the trusty slipper gift isn’t the most popular Father’s Day present – it’s actually a tie. 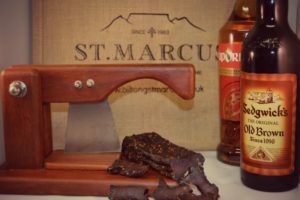 Although we’re sure your daddy would love a good ol’ tie, maybe Biltong and some klippies would fare better! If you still haven’t decided on what the get your father for his fathers’ day, browse our Butchery Section on our website for some mouthwatering gifts for Daddy. Don’t forget Klippies, Wilson’s Toffees and Cream Soda if he has a sweet-tooth! Thank him for all he does and make his special day one to remember when you treat dad to all his favourite goodies!Come in store and make your Fathers’ Day unforgettable! So, what will you be getting your dad? Get social and let us know on our social media!